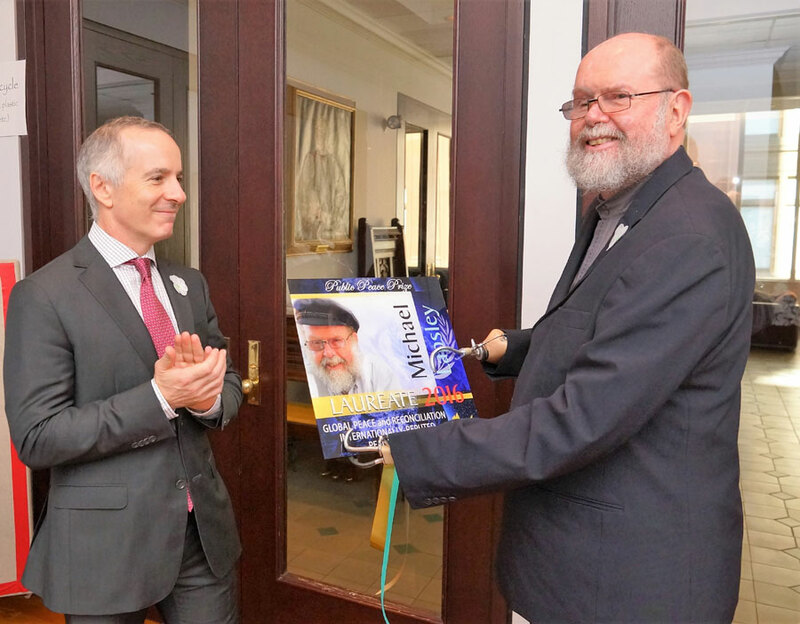 Michael Lapsley, 2016 Public Peace Prize winner in the category Global Peace and Reconciliation internationally-reputed peacemaker, deserved a commemorative plaque on October 6, 2016, in Montreal. The presentation was made by Brian Bronfman, cofounder of Grant Peacemakers Network and Outils de paix network, as the organizers and financial partners of the Centre de services de justice réparatrice welcome Michael Lapsley who will facilitate the first workshop in Canada offered by the Institute for Healing of Memories based in Capetown, South Africa. In our Institute for Healing of Memories, we say that all people have a story to tell, and every story needs a listener.Whenever we are able to listen with compassionate hearts to one another, we find that it is our shared pain that connects us. A key element in peace making is the full acknowledgment of how people have been wronged, and the opportunity to be heard. To break the chain that turns victims into victimisers, there needs to be safe and sacred spaces where people have permission to express how they feel about what happened to them and begin to detoxify. Dealing with the psychological, emotional and spiritual effects of the past are equally as important components of peace building as political, economic and social transformation. Michael LAPSLEY is a priest from South Africa who works with victims as well as authors of apartheid and other forms of repression and exclusion, and is publicly recognized for his disarming strength that has transformed wounds into powerful healing and reconciliation. He is visiting Montreal to offer a worship using his approach for healing memories. ← The Public Peace Prize at the Montreal World Social Forum!!! It gives me joy to know that the 2016 prize has gone to Michael Lapsley, a priest, who has been conversant with the theories and practices of eternal spiritual journey in which every single humanbieng , knowingly or unknowingly, irresprctive of his/ her social, cultural, religiois, and national belonging, moving ahead towards wholeness and holiness. As Michele is now most at the centre of the PPP network, I hope the place and the membership of God in PPP will be recognized and put to use of human members by encouraging and inspiring them to establish and deepen relationship with God who is the Lover of all lovers, Friend of all friends, Srvant of all servants, and the Lord of all lords.